The Llangollen Canal adjoins the Myddelton Estate and is one of the most popular waterways in Britain. Chirk Marina was constructed by the Myddelton Estate in the early 1990s and provides private moorings, holiday narrowboats for hire from Black Prince Holidays and Marine Cruises, and a small shop and chandlery for narrowboat owners. All marina enquiries can be made on 01691 774558. 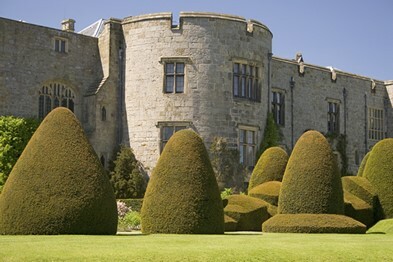 The Myddelton Familys historic family seat since 1595, Chirk Castle is an outstanding example of a border marcher fortress which is still lived in today. The Castle has been managed by the National Trust since the property was conveyed to the Welsh Office in 1978, and is now supported through CADW and the Welsh Assembly. The Myddelton Family still retain a suite of private rooms in the Castle, and the Castle and grounds are open to the public 5 days a week from March to late October in each year. The Myddelton family have played a central role in the history of Chirk Castle and it’s surrounding lands since the time of Elizabeth I. Today, in addition to traditional farming and environment management, Myddelton Estates provide a wide range of holiday and leisure opportunities including Championship and 9 hole golf courses, a narrowboat marina, fishing and shooting activities, a 4WD course, a trials bike course and further rural and outdoor pursuits - all supported by a selection of exclusive holiday properties. The ‘Marches’ border between England and Wales truly epitomises Britain’s green and pleasant land with sleepy, medieval villages nestling amongst some of the most unrivalled scenery in the Kingdom. Chirk Castle is an historic landmark and Myddelton Estates’ properties reflect the distinctive nature and style of the location. Our properties meet the needs of even the most discerning of holidaymakers with idyllic settings complemented by spacious dwellings - well equipped kitchens, cosy bedrooms and living rooms with superlative views - all luxuriously appointed and maintained to the very highest standards. The Myddelton family still operates a very ‘hands on’ approach to it’s estate work and places great emphasis on the comfort and convenience of it’s guests. These small individual touches give each of our properties it’s own personality, enhancing your stay and making your holiday even more enjoyable.